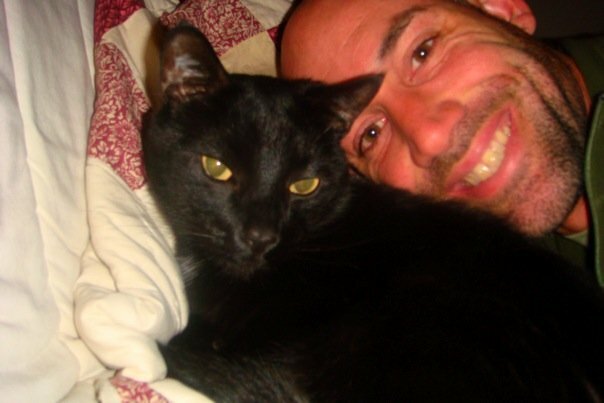 There isn’t anyone I know who loves animals more than my friend Doug. When I first met Doug many years ago he had just taken a two month road trip across the U.S. A long-awaited and dreamed about adventure for him. When showing me his pictures I noticed that many of them were either of animals, or of himself with an animal. I distinctly remember a picture of him on a trail in Glacier National Park kneeling down next to a mountain goat. Doug set up his camera on rock, set the timer and dashed next to the goat to get a picture of the two of them together. Whenever I recall this photo I picture Doug’s arm around the goat, this was not the case, but Doug took the picture as he would with any human friend; with a level of excitement and respect for having met someone new. The goat, in fact, seemed to be smiling. Amused, and perhaps a bit shy, yet flattered that it had been asked to be in a photo. Doug recently bought a beautiful home near Lake Arrowhead, California. Another lifelong dream of his that he has been able to accomplish. 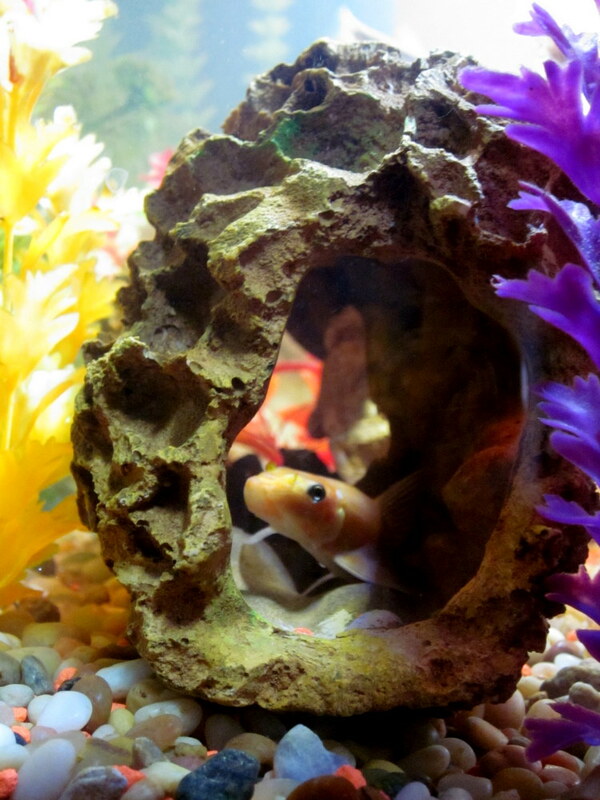 Living among the trees and the quiet mountain air, Doug lives with his two cats Topaz and Thicket, his dog Buddha, and two aquariums full of colorful fish in which he recently added two small blue lobsters. Outside on the deck there is a seed bell and a suet feeder for the birds. I know we saw blue jays the weekend I visited but other than that I can’t tell you who else flew by. What I can tell you is that they were small, colorful and very cute. Every time one landed to eat, Doug was consistently thrilled about the visit. With genuine enthusiasm and a sense of awe he greeted each small guest. I was particularly moved by this as I was reminded that, aside from our pets, we live with a whole population of non-human life every day that most of us rarely notice. Especially in the city where I live, I often overlook who I’m sharing my day with. The spider hanging outside my window, the lady bug on the small patch of grass by my apartment and the crow on the phone lines above often get missed. Sometimes when I wake up in the morning I hear the soft cooing of what is probably a pigeon but what I prefer to imagine is an owl. Either way, I always pause for a moment and enjoy its quiet communication, even if I can’t see who’s there. One of the highlights of my visit with Doug was when he showed me a gift he was recently given. From its home on the fire-place it looked like a giant piece of bone or perhaps some kind of white coral that I did not recognize. Doug held it up for me to take a guess before telling me what it was. 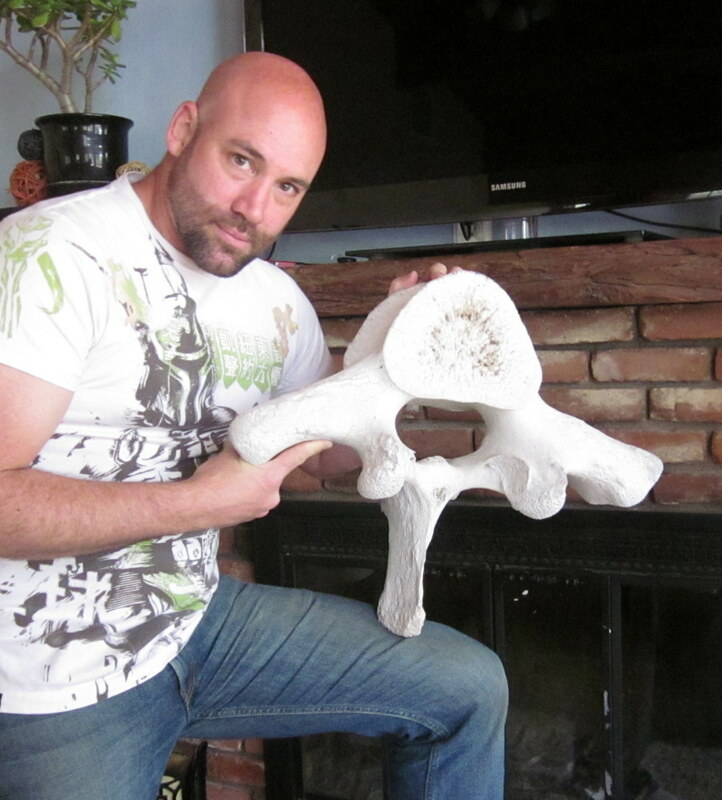 The minute he held it up I could see that it was a giant vertebra. 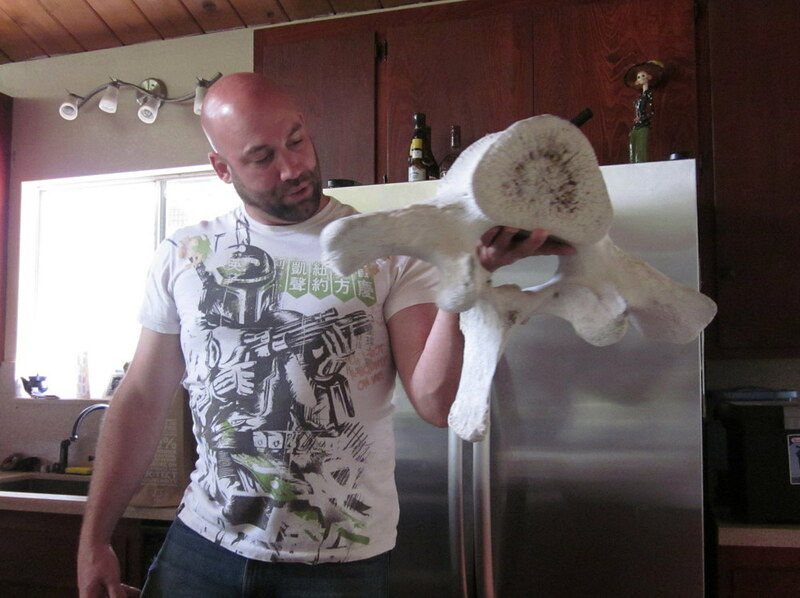 “it’s the vertebrae of a blue whale!” he said with contagious excitement. Wow, I thought. I have never seen anything like this. 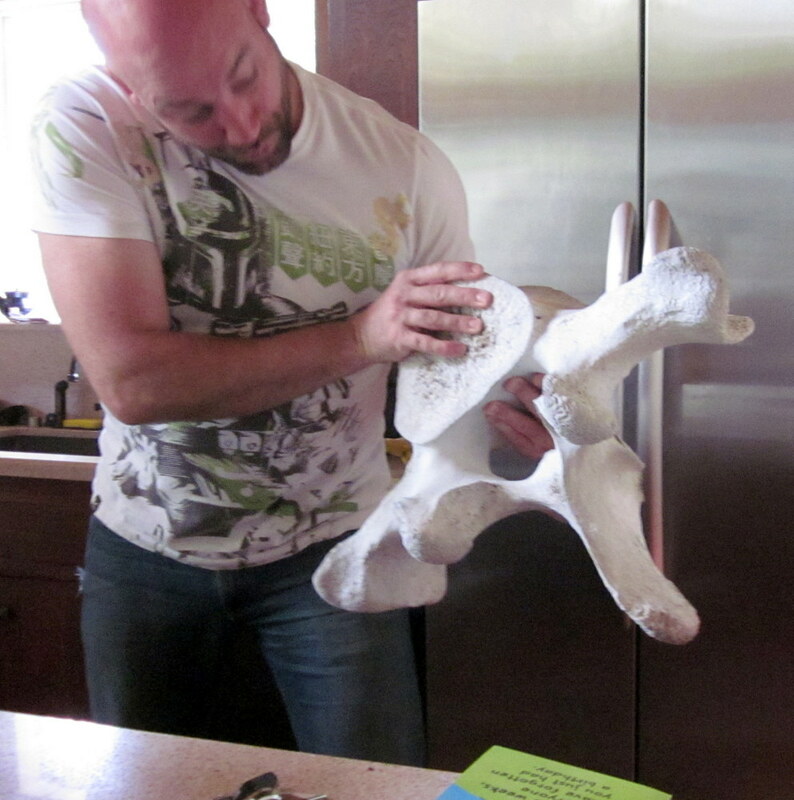 The large piece of bone was found by a friend of Doug’s who happened upon a whale that had almost fully decomposed on a remote island north of Washington State. “Imagine,” Doug said, “this came from one of the biggest creatures on Earth.” The deep reverence with which he said this transported me to a place of such gratitude for the miraculous world we live in. 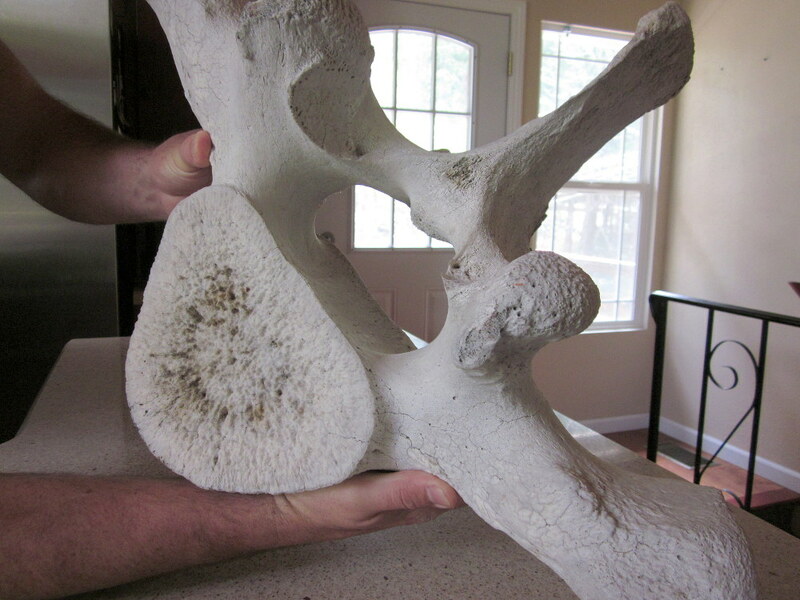 I sat there imagining the huge vertebrae in front of me slowly moving up and down as its majestic owner swam through the deep blue sea. At one time the beauty of this whale graced the waters it swam in, a work of art for any who happened to catch a glimpse. And now, something as simple as its vertebrae remains a work of art all on its own, with no less power and magic than the regal creature from which it came. Although it hasn’t been confirmed that it actually came from a blue whale, like my morning owl friend, It’s captivating nonetheless. A fish friend at Doug’s house. Lisa, thank you for sharing that beautiful story. You have a wonderful and graceful way with words. You’re right, I do love ALL of “God’s Creatures”, as my mother would say, and it’s cool that you remember the picture of the mountain goat. That feels like a lifetime ago!! Anyway, it was wonderful to have you up to the mountain and I look forward to your next visit!! Dougie fresh!!!! I really enjoyed this one Lis. I get excited when there is a Vinton in my inbox! Love it. That’s crazy!!! Wow, that is amazing that he has that piece. You described it perfectly, it’s neat to fanaticize about what it once was and where it came from. The mountain goat story made me laugh. 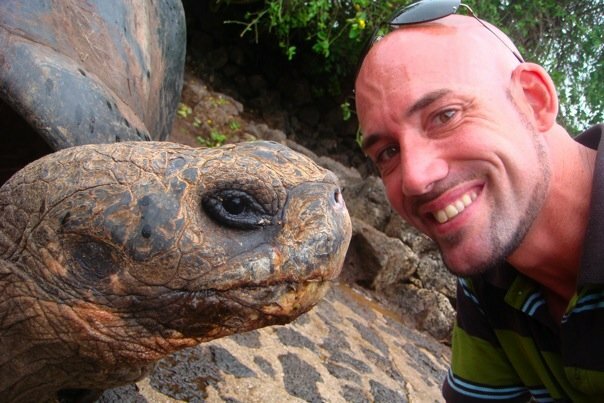 But what I found truly remarkable was the picture of Doug and the turtle. Is that some kind of freak dino-turtle?! Look at how big its head is compared to Doug’s!